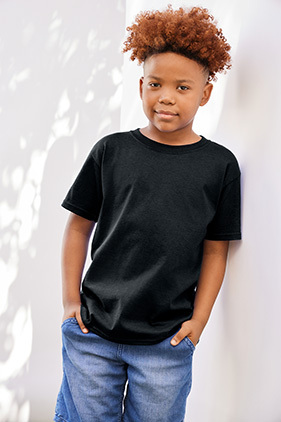 100% cotton 5.3 ounce youth jersey knit t-shirt. Seamless double-needle 3/4" collar. Taped neck and shoulders. Double-needle sleeve and bottom hems. Quarter-turned to eliminate center crease. CPSIA Tracking Label Compliant. Fiber content varies by colorClassic Fit. Tear away label. This Gildan style includes specific colors that are high visibility certified for use as background colors. CPSIA Tracking Label - This Gildan style is CPSIA Tracking Label Compliant.